Volume 16 of the Gabriel Wells Definitive Edition is Pudd'nhead Wilson and Those Extraordinary Twins. The Appreciation was written by Gilbert K. Chesterton. Chesterton was a British author, born in London. He attended both University College and Slade School of Art. 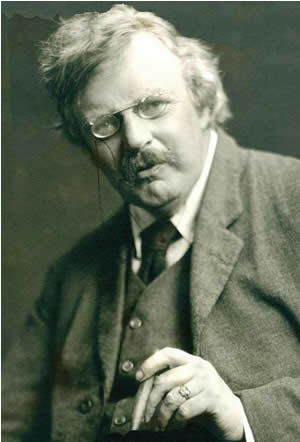 From art, Chesterton drifted in journalism and developed a flair for the paradox. In the early 1900s he worked on the staff of the London Daily News and later was a columnist for the Illustrated London News. Chesterton's major critical works are studies of Robert Browning (1903) and Charles Dickens (1906). Samuel Clemens's library contained at least two of Chesterton's works -- The Club of Queer Trades (1905) and Orthodoxy (1909), described as one of Chesterton's most important works concerned with social injustice. In 1911 he created the popular "Father Brown" detective stories. MARK TWAIN, like Puddn'head Wilson, was one in whom there was more than met the eye, though the phrase is unfortunate about a man whose appearance was so distinguished as to be dramatic and almost theatrical. Nevertheless the comparison contains an important truth. It is true that nobody at any stage was likely to say of that strange lean figure, with its shock of gray hair and its fierce eyes, any such simple luminary as "'Pears to be a fool." Still less would any one have confidently added, "Is, I reckon you'd better say." That Mark Twain was not a fool, but a wit of a very wild and Western sort, was apparent at very early stage. Nevertheless there is no more typical example of a Mark Twain joke, and no more excellent opening for a Mark Twain story, than the unfathomable perversity of the problem of killing half a dog, and the efforts of the rustic philosophers to fathom it. That is indeed one of the marks of the sort of American irony which Mark Twain represents. It is sensational and extravagant, yet somehow it is far from self-evident; there is something baffling and bewildering about it. Like the remark about the dog, it is too outrageous to be obvious. Moreover, the last effect of it is rather different from the first. When in our boyhood we first began to read Mark Twain, we were swept off our feet by the sheer farcical violence of extravaganzas, like the episode of editing an agricultural paper, or the episode revolving round Horace Greeley's handwriting. There was something of brute force about the buffoonery; it made us laugh as a bludgeon might have made us cry. But looking back on our boyhood, we realize that while we were consciously devouring this we were unconsciously digesting something else. When we were boys we were interested in buffoonery; now we are no longer boys, we are more interested in boyhood. And what lingers in a most living fashion in our memories is not the Mark Twain of the Innocents Abroad, but the Mark Twain of Huckleberry Finn. Tom Sawyer is in a far better sense innocent, and even in a far better sense abroad; for all his own land is strange to him, being seen with the sacred surprise of childhood. Mark Twain is only a tourist in foreign countries; but he is an adventurer in his own country. We feel that he thinks he knows all about Rome or Jerusalem before he gets there; for that is the shriveling and desiccating mark of the mere tourist. But we never feel that Tom Sawyer and Huck Finn know anything about the next thicket or islet to which they come; and their story is a true Odyssey. Of all conventional travelers the skeptical and contemptuous traveler is the most conventional; he never allows himself to be surprised out of his conventions of contempt. The Rhine and the Tiber and the Jordan shrink into mere lines upon a map; and the whole world narrows into a parochial chart. But in the romances of boyhood the great river of the West goes by like a sea with a single purpose, and all its little Crusoe islands are like the islands of the blest. Something of the same paradox can be found in his other tales, especially his tales of Old Dixie, and not least in the tale of Puddn'head Wilson. Regarding Mark Twain as the great wit of the New World, and knowing his pride in certain new ideals and even new negations, we think of him first as the champion of things that are new. But indeed the most genuine interest of a book like this concerns not so much the novelties as the antiquities of America. Many people do not know that there are any antiquities of America. They are people who do not know enough about Old Dixie; least of all why it was so affectionately called old. The point is very well illustrated in the case of this particular book. All the things in it that many have thought new, all the things that Mark Twain himself may have thought new, have since been so generally used as to be in danger of being stale. The business of the fingerprints of the criminal has been multiplied over a million less amusing murder stories. Magazines devoted to detective stories actually advertise for fingerprint experts, and offer every ardent and visionary youth the opportunity of being a Puddn'head Wilson. Detective stories are written of which the neatness, if it be a mere mechanical neatness, is still sufficiently neat to make this old murder story look comparatively rough and ready. What may be called the scientific side of the story looks almost as old-fashioned as all the science of to-day and to-morrow will look after the next change of fashion. But what is really recognized as old-fashioned never goes out of fashion. History is humanity; and living links with the past can always give us a touch of life. What remains most interesting in a story like this is the true touch of the life of the Old South and the memory of the last fighting aristocracy of the world. That sort of thing will always be studied, precisely because it cannot be replaced. Of that world Mark Twain unquestionably writes, if not with approval, at least with sympathy. He may not have approved of the fierce sensibility of the fighting gentry, any more than he approved of imperialism. But he certainly respected the duel of Judge Driscoll and Count Luigi much more than he respected the South African War or the Spanish American War, in which preference one humble individual will venture to agree with him. All his sketches of the statelier sort of Southern squire are full of an unmistakable moral tenderness for his magnificent if mistaken ideals. It is perhaps worth while to touch on the point, partly because it is the best sort of sympathy which many who regard Mark Twain as a sort of Yankee clown would expect to find in him, and partly because it is in curious contrast with the occasions when he really did appear rather in the less dignified character-in the character which carries him through the travels of the Innocents Abroad. It is curious to contrast his attitude towards chivalry in Puddn'head Wilson with his attitude towards chivalry in A 'Yankee at the Court of King Arthur. The code by which the old Southern gentry lived was as arbitrary, as mystical, as merciless and deadly as any feudal system that ever led men to battle, or any wild vows ever sworn by half-baptized barbarians in the Dark Ages. But Mark Twain, having lived close to American chivalry, knew that it was chivalrous and not merely barbaric. Knowing nothing whatever about Arthurian chivalry, he chose to assume that it was merely barbaric and not in the least chivalrous. If he had read in Map or Malory, or any medieval chronicler, the account of a father or uncle forcing a boy into a bloody tournament, as the old judge tries to force Tom in this tale of Old Dixie, he would have noted nothing except a brutal old baron forcing the innocent into murder or suicide. Yet we led he does not suggest this as the whole truth about old Driscoll, because he knew it was not. If he had read of a feudal custom in the twelfth century, by which under certain conditions one knight could kill another at sight with an arrow or the quarrel of a cross-bow, he would certainly have said that such people were lower than savages. He did not say the Southern gentry were lower than savages, because he knew better. If he had known as much about Arthurian chivalry as he did about American chivalry, he would also have known better. But it was partly a certain sensibility amounting to jealousy in which he was akin to these American aristocrats, that made him thus bitter about all but American aristocracy. Towards Europe he turned too much the face of a mere farceur, but very largely because he had the same sort of touchy pride about his own nation that a man like Driscoll had about his own family. His satire had something of the acerbity of a poor relation; but of a very spirited and independent poor relation. And the element is worthy of note precisely because in him it went along with all the nobler elements of the same spirit. For Mark Twain himself was truly a chivalrous figure, and looked it. He was chivalrous in his power of fighting for unpopular causes, in his contempt of clamor and coarse unanimity, in a certain instinct for saying defiant and dramatic things, if they were only a sort of grim jokes, on great and crucial occasions, in his strenuous probity and his last great fight against economic misfortune. If there was sometimes the note of something shrill in his satire or his scorn, it was connected with the sense that he was not fighting altogether for comfortable or powerful things; so that there was nothing vulgar even about his impudence. The Yankee never found his way to the real court of King Arthur, but only to some rather clumsy political pantomime of his own invention. But if he had ever found the real court of King Arthur, he might very well have been knighted there. It was at Nauheim, Germany, during the summer of 1892, that Mark Twain began writing that fanciful, grotesque burlesque "Those Extraordinary Twins," which later was transformed into Pudd'nhead Wilson. In a letter to his publishing partner in New York (then Fred J. Hall) he referred to the story as a "howling farce," and the reader who follows the tale, given as the second feature of the present volume, will probably agree with this opinion. Mark Twain, like many another writer of genius, did not always direct his story, but was directed by it. His characters led him as they pleased -- often into byways, and strange situations scarcely warranted by artistic rhyme or reason. It seems to have been so in this case. When his difficulties with "Those Extraordinary Twins" had about reached the impossible from every point of view (he was by this time at Florence, Italy), he overturned his structure altogether, and out of the fragments, with the addition of some valuable new material, constructed the story of Pudd'nhead Wilson. It was a fortunate performance, for he made something quite worth while out of what was as near a literary nothing as could come from a man of his gifts. The story is interesting; its background, the slaveholding South, is convincingly true. There are not many situations in fiction more essentially dramatic than that of the half-breed Tom selling his mother down the river into slavery, while the characters of both Tom and Roxy seem always real. "Pudd'nhead Wilson came into my mind as an example of that unfortunate type of human being who, being misunderstood at the moment of entering a new community, may spend a lifetime trying to live down that blunder, especially if he gets catalogued by some ridiculous nickname. Of course, in my story I brought Wilson out triumphant at the end, but it is not always so in life. Many a man has been labeled a fool, and has died with that label still on him, when the community might very well have gone to him for wisdom and counsel." The character of Pudd'nhead is lovable and fine, and his final triumph at the murder trial thrilling in the extreme. The identification by thumb-marks was a new thing in fiction -- in law, for that matter -- and Clemens used it with great effect. It is chiefly Pudd'nhead's philosophy, however, that will preserve his memory. Such aphorisms as "Man is the only animal that blushes -- or needs to," "Few things are harder to put up with than the annoyance of a good example," "When angry, count four; when very angry, swear," have in them the substance of immortality. Pudd'nhead Wilson was published serially in the Century Magazine, beautifully illustrated by Louis Loeb; and Mark Twain's original publishers, the American Publishing Company, of Hartford, brought it out as a book, for by this time his own publishing-house had failed. It was also dramatized by Frank Mayo, who played it successfully as long as he lived. The characters in Pudd'nhead Wilson do not seem to have had any particular originals in life. Naturally, Mark Twain, as always, drew upon his early experiences and the characters of his youth for traits and incidents, but there can be no such identification of personalities as are to be found in his earlier tales -- in Tom Sawyer, for instance, and The Gilded Age, or in Huckleberry Finn. The Gabriel Wells Definitive Edition of Pudd'nhead Wilson and Those Extraordinary Twins features six illustrations that had originally appeared in the 1899 uniform edition from American Publishing Company -- five by Edward Windsor Kemble and one by Frank M. Senior. "Encyclopedia of World Biography on Gilbert Keith Chesterton." Online at Bookrags, accessed 13 June 2010. "Gilbert Keith Chesterton." Online at Literature Network, accessed 13 June 2010. "G. K. Chesterton, 62, Noted Author, Dies," The New York Times, 15 June 1936, p. 1.